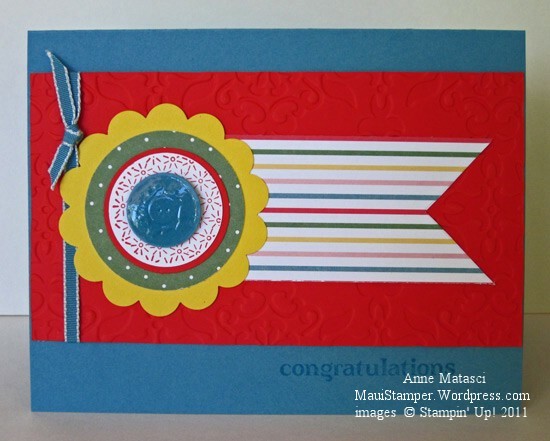 How about another piece of Just Add Cake Designer Series Paper? Do you like my “Button”? If you’ve got the Big Shot and the Sweet Buttons Embosslit, you can create a faux button in multiple sizes and just about any color you desire. This may come as an enormous shock, but I am not very good at planning ahead. I have the BEST of intentions, but when it comes down to it I am generally scrambling like a mad woman at the last minute. Time is just so slippery! As a result, I neeed flexible resources, and this Button Embosslit suits my needs perfectly. This is a pretty bright and bold card for my usual style. I like to step outside of my comfort zone from time to time, and I think this card should cover me for quite a while! Not sure I’ll be jumping into these colors again anytime real soon, but it’s fun to stretch.